One of the most spectacular self-discovering journeys, literature has known, has found a perfect adaptation on screen. We all say, at least once in our reader/spectator life that cinematographic adaptations never match the quality of the novels. Some do, some adaptations enrich the original to a point that one cannot be taken into consideration without the other. It is the case of Sally Potter’s Orlando based on Virginia Woolf’s novel, Olrando. If you read the book and see the movie, no matter in what order, you will never think of one without considering the other. At least, that is my case. Orlando is about a person’s journey to the inner self, to the perfect equilibrium of the human being. It is neither a man’s journey nor a woman’s, it is the voyage to freedom of the genderless heart and mind, encaged throughout history in the “how you should be” rules of the male or female behavior. The story is perfect; out of an excellent novel came out an excellent script: witty and sparkling. The dialogs are memorable (they should spice up anybody’s conversation in social circles). The roles are played perfectly by an outstanding cast. 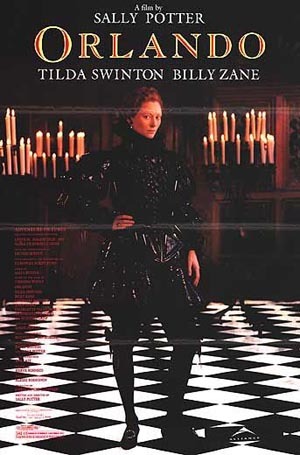 Tilda Swinton playing Orlando is a delight. Naïve, idealistic as Orlando can be, Swinton still finds ways to slip in some auto irony. But what really makes this movie a masterpiece relies in what makes cinema a fully grown art: composition of the image, angle and montage. All that the seventh art can give back to the major arts, it so much stolen from in the beginning, is to turn stones and oil into animated lights and to turn poetry, music, and architecture into a realm where these are of equal texture. The plastic composition of the image in Orlando gives the movie its style. The cinematographer (Alexei Rodionov) chooses to shoot scenes using the classic frontal perspective. The composition of the image is strictly built on horizontals and verticals giving a sense off static and rigidity. All this matches perfectly the times Orlando’s is trapped in. There is a single exception when the operator indulges us with a view from above; in the scene where Orlando returns from Far East, it is also one of the rare occasions when we can see oblique lines in the composition. A perfect moment to escape the western classical golden measure the renaissance came up with. Orlando has just made a big step toward completeness. The choice of color and light/shade combination is, in the first half of the movie, indebted to the Dutch and Flemish renaissance and Northern mannerist painting; so crafty, opulent and attentive to details. The montage counterbalances the composition. It is alert and lightens up the atmosphere, contributing to the ironic view of the director on all characters (Orlando included) and social customs. The irony does not stop here; the costumes are also tools that outline ridiculous gender and social standards everyone takes so damn seriously. Orlando is a story about freedom and happiness on one’s own, by one’s own means. Fellow humans are all blown by the winds and there’s always rain after their departure. We are all following our dream on our own, needing the company of others only when faith in accomplishing that dream fades, when we are strangers to ourselves or when an ankle twists. Humans should search for unity inside themselves before searching for company. This is what we should do to stand firm against social, political, economical, well, life’s adversities. This is what Orlando stands for.